For a limited time, starting Feb. 15, medieval warfare MMO Conqueror's Blade will open its beta test to all registered Warlords. The game is currently in its first closed beta phase and developer Booming Games and publisher My.com are honored by the ongoing mayhem. They now announce to swing open the gates to introduce every aspiring Warlord to the latest features of Conqueror’s Blade. The dedicated European and North American servers running until Feb.17th will give all registered players a taste of the thrills of medieval combat ahead of its Open Beta launch later this year. •	24/7 server access: No more time restrictions, the servers are planned to be up all day, every day until February 18 (6:00 CET). 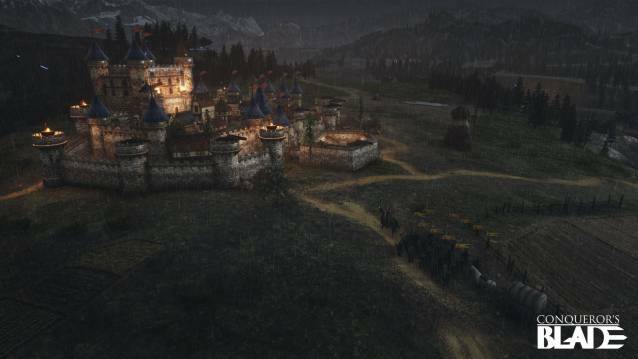 •	New tutorial: As soon as players create a new character they will be taken to a quest-based tutorial area to learn the fundamentals of melee, mounted, and siege combat, as well as unit leadership. Afterwards, they can choose a home region, with varying cultural influences to start their adventures. •	Dynamic campaign: No longer limited to inconsequential castle sieges, warlords are encouraged to explore the unique Gameworld; to secure resources - by trade or by conquest - and to establish themselves in competition with other players and roaming NPC bandits. •	Crafting and development systems: Warlords will divide their (peace) time between friendly settlements and their personal camp, between which research and resources will be acquired and spent to develop raw recruits into elite units equipped with the finest arms and armour. •	Territory Wars: On alternate days armies can take part in Territory Wars, which are effectively declarations of all-out war. Attacking armies will converge on their pre-preferred targets, while the defenders must effectively come together to try to send the invaders packing. •	New maps: As well as new siege maps, there are new field battle locations that simulate the kind of skirmishes that occur when opposing armies meet on the open road or away from major settlements. Some of these battles can be played in PvP or PvE (using the same matchmaking system). Conqueror's Blade offers the experience of being part of a medieval great House, jointly making decisions both on and off the battlefield, with strategic alliances determining which Houses will rule over the open world. Players focused on thoroughly testing out the game’s social functionality can join with their friends in the "House Members Only" Closed Beta Test starting Feb. 18, following the Closed Beta Test.